Weatherproofing the home or building leads to having more control over the temperature inside. Weatherproofing windows, doors, and rooms such as the attic also leads to reduced heating and cooling costs. Cold weather can be fun when skiing, having snowball fights, and using your garbage can lid as a makeshift sled, but none of those activities occur inside the home. Air leaks, gaps, cracks (or however you want to see them) in your window sneak outside weather into your home and lead to higher fees onto your energy bill. Keep drafts at bay and your monthly energy costs low by using one or more of these inexpensive tools to weatherproof windows. Foam tape is usually used to seal windows that slide or swing. It works just as the name would suggest, sticking to the edges or bottoms of windows to prevent air leakage when windows are closed. Installation: At less than $3, not only is foam tape a fairly cheap weatherization solution, it’s easy to install. First, clean and dry the area (must be more than 40 degrees Fahrenheit) where the tape will be applied. If the area is dirty, wet, and/or cold, the tape won’t stick properly or it will easily loose its stickiness factor. Cut the amount of foam tape needed based on the length of window sides/bottom. Remove the adhesive backing then press the tape into place to cover the area in need of sealing. 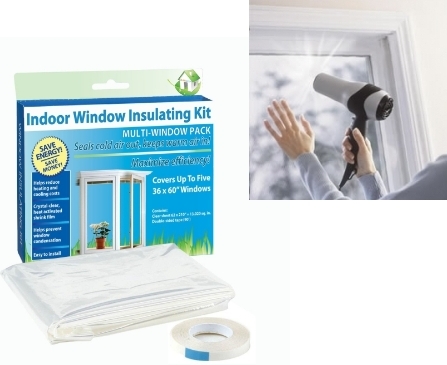 If you have scissors, a blow dryer, and $4 you can easily weatherproof windows with a Shrink and Seal Window kit. This kit will seal the whole window from the inside and increase the R-value, or insulating power, of the window by as much as 90%. As always, clean and dry the area before applying any sealing. You should also clean the insides of windows because you won’t be able to clean that area again until you remove the shrink film. Cut the amount of shrink film needed. Cut enough film to cover the entire window (including some of the frame area). Remove the backing from one side of the two-sided tape and stick it to the top, bottom, and sides of the window. After installing the tape, remove the adhesive backing from the other side. Apply the shrink film around the window, gently stretching it as you work your way from one corner of the window to the other. With the blow dryer on the highest setting, slowly move the dryer across the film to tighten it over the window. Don’t stand too close to the window while doing this, otherwise you’ll melt the shrink film. Trim any film that’s left over. The V Seal Weatherstrip, which is much like tape, is another $4 tool that allows a hassle-free installation and removal. Clean, measure, then cut as always. Clean the area. Measure how much V Seal strip is needed then cut away. Bend the strip down the marked center line to create a “V” shape. To seal, remove the backing and press the V strip into the corner of the window. Caulking is a method of weatherstripping that targets the crack, gap, hole, or opening that allows air to seep through. Basically it’s like sticking silly putty in the exposed area to seal it off. However, unlike silly putty rope caulk provides a better stick, can weatherproof windows in an weather condition, and is a lot more pleasing aesthetically (unlike your lime green putty). Clean, clean, clean the area where caulk will be used. Peel of a lay of the rope caulk “beads” and divide it based on how much you need. Though it’s easily overlooked, your window AC unit could be a major player in the game of air leakage. Window AC covers are often placed on the outside of inside units, but those covers only protect the unit from wind and rain. Installing window AC covers indoors will give your unit added protection by stopping air leaks. Tape the insulation liners to the face of the air conditioner and place the fabric cover over the windblock liner and air conditioner. Before you purchase an AC cover, measure the air conditioning unit because covers come in three different sizes. With weatherproofed windows you can still enjoy skiing, snowball fights, and garbage lid sleds without the threat of winter weather becoming household guests. Air conditioners can be a gift from the heavens during sticky summer months, but as the seasons roll into cooler weather, those same air conditioners are a silent source of energy and monetary waste. Prevent energy loss, lower your heating/cooling costs, and protect the quality of your AC unit with window air conditioner covers. AC units get a much deserved break during cold months, but even when turned off they can still use up much energy. Uncovered air conditioners allow the cold outside air, dirt, dust, and other undesirables to enter the home and mix in with the warm air the heater provides. This creates an uncomfortable, inconsistent temperature throughout the house – some rooms are too hot, others too cold, and if you’re lucky at least one room will be just right. Air conditioner covers prevent energy loss by blocking the flow of air into and out of your home. Energy loss does not only affect the house – it can be a drain on the energy bill as well. How much of your energy bill do you think is due to heating and cooling alone – under or over 20%? 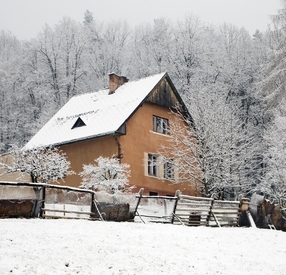 Believe it or not, 43% of your energy bill is devoted to keeping the house warm or cool. Along with other insulation solutions, you can erase 20% or more off energy costs with window air conditioner covers. When installed properly, AC covers keep the unit from acting as a source for air leaks. Though less energy waste is the ultimate reason to use AC covers, it is not the only one. AC units also need protection from damages. While it’s less pricey to do it yourself, the process takes a while and calls for removal of some parts in order to reach moldy areas. Window air conditioner covers are waterproof, making it easy to protect the air conditioner (and your health) from damages. Plus, the only manual labor involved will be installing the cover. Even the less crafty of us can install an AC cover. All you need to provide is measuring tape because cover packages come with rest: fabric cover, plastic waterproof sheets, adhesive tape to secure the cover, and instructions. Measure your AC unit to ensure that you purchase the right size for your air conditioner then follow the instructions for the cover. No longer do cold weather months have to wreak havoc on your AC unit. Stop the energy waste, the sapping of your money, and the discomfort in your home by installing air conditioner covers. Creaky, drafty attics certainly have a place in the world of horror flicks, but that draftiness does nothing for the homeowner. Three often overlooked sources of poor attic insulation are the stairs, knee wall doors, and the scuttle hole access. Using a stairway cover is one way to shield all three of those areas from causing inconsistent temperatures in the attic and a bigger (much scarier) problem on your energy bill. It may seem insignificant, but that large hole in the ceiling does nothing to stop air leaks. Attics stairs usually take up 10 sq.ft. of the ceiling, leaving a huge gap around the opening for air to swim on through. Installing a stairway cover requires a little bit of work but yields obvious results. When building an attic under a sloped roof, that sloping creates an oddly shaped space underneath it. The shape is like folding a piece of paper in half, laying it flat, then lifting the top halfway up – simply put, a sideways triangle. A knee wall is basically a short wall that creates a room out of that space. To get in and out of that area (naturally), you need a knee wall door. Sometimes a knee wall door can lead to a space that is outside the home (usually the area is there to ventilate the roof), giving opportunity to air, critters, and who knows what else to make its way into your home. Properly sealing knee wall doors should definitely be a high priority on your insulation list. 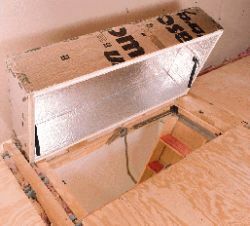 The attic scuttle hole is small, usually 2′ x 2′ entrance way to the attic. If a home doesn’t have stairs that lead to the attic, then the only way to get into it is through a scuttle hole. Just like with attic stairs, the area around the scuttle hole is where the damage occurs. A stairway cover or attic cover will work just as well on attics that only have the scuttle hole access; you’ll just need less material. Now the attic can still be a scary place but insulating it doesn’t have to be. To minimize stress with this DIY project, use the right tools, wear protective gear if needed, and read the instructions before working with insulation products. In our second installment of the “How to Insulate your Attic Stairway” series, we discuss another option to reducing drafts emanating from your attic stairway. For our previous post – see How to Insulate that Folding Attic Stairway with a Thermadome. 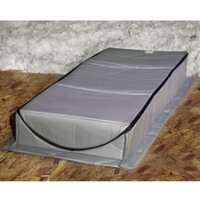 The Attic Tent is an affordable, easy to install, lightweight solution that consistently gets great reviews from DIYers. It’s pretty much full assembled, all you have to do it get a staple gun to tape it down to the attic floor opening over the stairway and caulk down any loose material to get an extra good seal. Start to finish you can get this done in 15 minutes. It’s very effective in creating an air barrier and has a R Value of 3.2. You can almost see temperature difference and the associated cost savings immediately. It’s available in 5 sizes, so you’re almost certain to find a size that fits your attic stair way opening. Another plus to this solution is that a lot of electric companies offer a rebate on this product, sometimes as much as half the cost, so be sure to check with your local energy company. So you have an attic on the top level of your house and it’s leaking gobs of cold air out in the winter making 2nd floor of your house frigid. How to fix it? In this 3 part Attic Insulation series, we will investigate 3 solutions for insulating your folding attic ladder/stairway. Each solution has its own unique strengths. We hope to help our readers find the best solution that fits their needs. 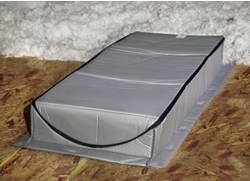 Solution 1: The Thermadome by Yankee Insulation Products: an insulated cover for your folding attic stair way. Since it’s constructed out of a durable laminated foil urethane insulation, it provide a very high R-Value of 13.6. The foam gaskets and velcro ti-downs around the product provide continuous draft seal. The inside dimensions of 27″W x 57″Lx10.5″H are spacious enough to accomodate most attic stairway openings. Assembly is straight forward, all you need to do it to caulk/glue all the pieces together. So if you’re looking for a solid, rigid, high R value solution, the Therma-Dome attic stairway cover will do the trick. Polyurethane foam has been around since the 1970s, but its use has recently exploded with more and more people jumping on the conservation bandwagon. DIY spray on insulation is a simple, cost-effective solution to air leaks in the home, blocking air intrusion and escape at the same time. In order to get the most out of foam insulation, here are a few bits of information to keep in mind. What Foam Do you Need? The biggest factor to consider when deciding which foam to use is simply this: how much area do you need to cover? Both the high expansion foam and low expansion foam expand to cover the area where sprayed, but they differ in a few ways as well. High expansion foam covers larger gaps, cracks, and the like than low expansion foam. It also expands 30x when sprayed at 1″ thickness, so I’d advise against spraying liberally. In contrast, low expansion spray foam is best used on smaller gaps and only expands by 10%. 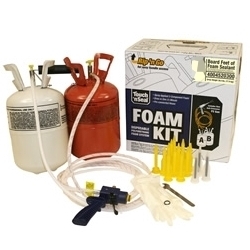 The 2-tank foam system makes installing foam insulation an easy do-it-yourself project, so as with any DIY project, make sure to wear protective gear. The 2-tank system uses high expansion foam, so remember that spraying 1″ of thickness will expand 30x. Which Rooms Need it the Most? When installed in the most drafty, gap-ridden areas in the home, polyurethane foam insulation can save you up to 20% on cooling and heating costs alone. So which areas have the most potential for energy loss? These areas typically suffer from poor insulation, making it easy for winter and summer to wreak a lot of havoc. Attics and garages can sometimes reflect (and even magnify) the temperature outside. Their main source of insulation problems come from the ceiling and walls; check there first before going over the rest of the room for any missed gaps and cracks. Basements often deal with humidity, which can lead to mildew and mold. First, make sure the basement receives proper ventilation, then seal all the air leaks. For basements, air leaks can be found around areas that lead outside, like air vents, ducts, and pipes. It may not seem like a big deal, but exterior gaps can cause just as much insulation problems as the ones inside. Dryer vents and water faucets (with hoses) are unexpected culprits of air leaks and can also contribute to that inflated energy bill you see each month. Applying polyurethane foam insulation will help you control the temperature in your home and finally get a better grasp on the outcome of your energy bill. Need an outside solution to poor insulation? If you’re a fan of DIY projects that take less time, require less energy, and cost less money than your weekly commute, consider black foam – an easily installed, quick and efficient sealant. 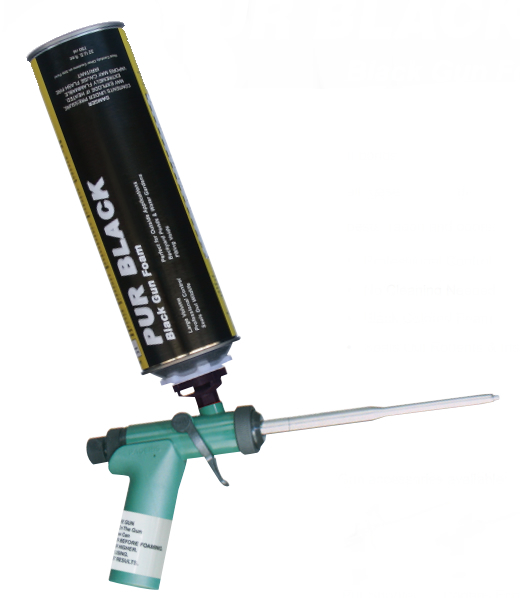 A foam applicator gun is required to apply this foam. Can sizes vary, but you can typically expect a 750 ml canister to provide enough foam to insulate 2,820 cubic inches (or 1,200 linear feet) when dispensed at 1/2″ bead. Within 10 minutes it’s tack free and ready for trimming in 30 minutes. Though this type of foam is usually used outdoors, it can be used in attics, basements, and to seal up doors and windows. The biggest advantage of using this type of foam is that it properly insulates your home, and that allows you to save money on energy costs while creating a comfortable environment in your home. You’re getting a high quality product for less than you spend on coffee in a week with this foam; it isn’t just a simple DIY product. Many professionals such as contractors, roofers, and even pest and wildlife control specialists use it to create a properly insulated environment along with stopping bugs and rodents from becoming unwelcome guests. During the hotter months of the year, there is often nothing more comforting than knowing you have a working air conditioning unit. If this unit is of the indoor wall variety, that comfort can easily become an annoyance as cold weather sets in. Drafts can easily enter the home through these units, which not only causes heat loss and discomfort, but raises energy bills as well. 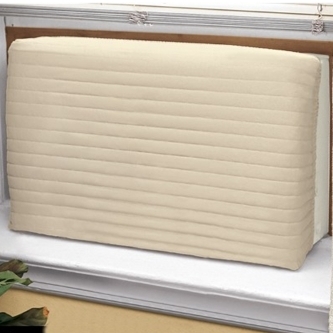 Installing window air conditioner covers helps you stay warm and save money on energy this winter. 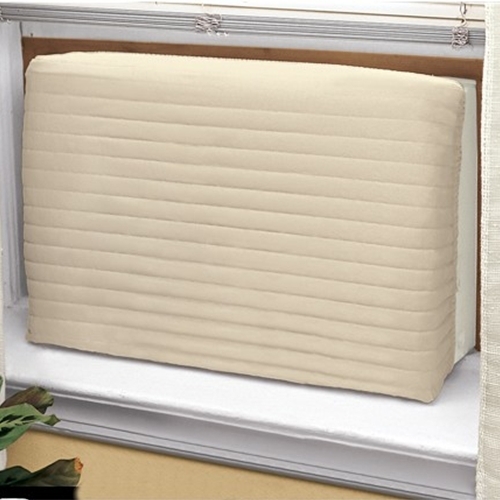 Window air conditioner covers come with a fabric cover, waterproof sheets (windblock liners), and a roll of tape. The fabric has an insulating fiber on the inside, and is designed to fit perfectly over the unit. The sheets are taped to the unit to protect the seal from inclement weather conditions and keep the air waterproof. In addition, this layer prevents cold air from coming into the room through the air conditioner. In doing so, the insulation is saving energy, by reducing the amount of energy the heating unit requires to warm the home up. In turn, this leads to savings on energy costs. All you need to install window air conditioner covers besides the items they come with is a pair of scissors. Important to keep in mind is that the tape holds best when the temperature outdoors is above 35Â°F. Unplug the air conditioner and wrap the electric cord as tightly around the front edge of the unit as possible. Hold it in place using a 3″ piece of tape. Measure the width and height of the unit, adding 6″ to each measurement. This is the measurement you will use when cutting (with scissors) the windblock liners. Place the windblock liner over the front of the air conditioner, allowing it to overlap by 3″ on each side. For the best results, make sure the windblock also covers the electric cord, plug, and the place on the unit where the cord exits. Fold and tape square corners, then use the tape to hold the complete edge of the liner to the unit. Make sure that the tap overlaps so half is attached to the liner, and half is attached to the air conditioner. Place the fabric cover over the air conditioner. By insulating the window AC unit, there will be less outdoor air interfering with the temperatures inside the home. Limiting the places where drafts can enter the home results in gaining more control over home temperatures, reducing the amount of energy and heat lost, and spending less money to keep yourself and your loved ones warm this winter. As the year draws to a close, people are planning various parties, decorating their homes, and coming up with resolutions they’re sure to break within the first few months of the new year. It also happens to be during this time of the year that many see a dramatic increase in the amount of money paid for energy, specifically for heating. This is due largely to poor insulation, which allows the air from outside to make its way into the home. One of the simplest and most cost-effective ways to reduce this problem is by installing plastic windows. Windows make up anywhere from 10 percent to 25 percent of home heat and energy loss. You may be wondering how an item that sounds as simple as a plastic window could possibly eliminate this loss, or even lower the amount. The plastic film is also an insulating film. When correctly installed over the face of the window, it blocks cold air from entering the home through windows, which will also stop the warmer air from leaving. Plastic windows, also referred to as interior storm windows, come in two different styles: those with channeling, and those without. Channeling: This type of interior storm window comes with plastic channeling, clear film, and adhesive. The channeling coupled with the plastic gives the appearance of placing a new window frame over the existing one. Without Channeling: Storm windows without channeling include only the insulating plastic and a roll of tape. Although it has less components than the windows with channeling, it has more steps for installation. Both types are also cost-effective. Storm windows without the channeling cost approximately $3 to $6, while storm windows with channeling are valued at $9 to $15. They are available for a variety of window sizes, so be sure to take measurements before making a purchase. Attach plastic channels around the frame of the window. Over the face of the window, spread the plastic insulation film. Using the thin plastic strip (the spline), hold the plastic in place, and lock it into the channel. Trim the channels and spline if necessary using a utility knife. The plastic film can be trimmed with scissors. Clean around the window surface’s edge, and allow it to dry. Cut the plastic film in a way that allows there to be a 2-inch overlap on either side of the window. At the top of the window, press the plastic against the tape lightly, and gently stretch and press the film at the bottom. Carefully repeat this along the sides. Once set, press the plastic film firmly against the tape. Using the highest setting on a hair dryer, pass it over the film. Make sure the dryer is being used at a 1″ distance, and never comes in contact with the plastic. The film should shrink until all wrinkles appear. Trim away any excess film with scissors. Once the window insulation has been installed, you won’t have to worry about cold air coming in through your windows while heated air leaks out. Also, with 10-25 percent of heat loss eliminated from energy costs, the fear of higher energy bills this winter will also be pushed to the back of your mind. Call them cracks, gaps, leaks or however you want to see it, but any opening that allows air through the door adds stress to your energy bill. Prevent air leaks by sealing gaps with exterior door weatherstripping. You’ll gain control over the energy usage in your home while trimming the energy expenses off your utility bill. It doesn’t matter if the crack, gap, or hole is micro-sized or big enough to slip a few magazines through; any air leak takes the comfort out of your home and costs you extra in heating and cooling expenses. If the sunshine outside is spilling into your home through a closed door, you have an air leak situation. Another way you can tell is if rain always finds its way inside your home through doors even when the door is closed. Easily combat this issue by installing exterior door weatherstripping. 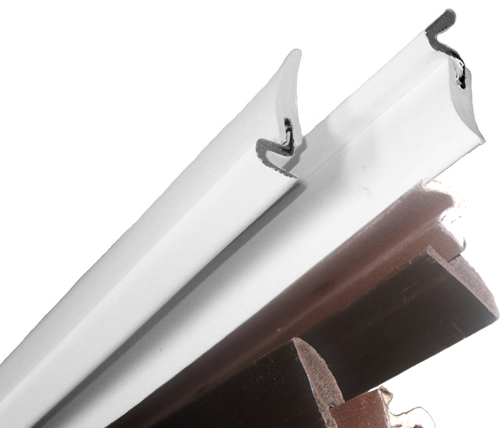 This type of weatherstripping seals up to 1/2″ gaps on standard doors and can be cut to fit smaller doors. Raises your energy bill. Every increase/decrease in degree that you turn up/down the AC or heater causes you money. Well, sealing only keeps out the type of guests that can squeeze through a closed door. Bugs and other critters are always on the hunt for ways to enter your home. Installing exterior door weatherstripping leaves one or two less ways for them to invade your home. Sealing door exteriors is a simple solution to a costly and energy-stealing problem.